Members of the Speech and Debate team prepare for a tournament. Photo by Memphis Cutchlow. The Rock Bridge Invitational is the only tournament the Bruins host during the Speech and Debate season. The team solely runs the event and does not compete. 11 schools participated in the tournament. The two day competition started Friday, Feb. 8 at 4:45 p.m., and after many preliminary, quarterfinal, semifinal and final rounds, it ended Saturday at 9:30 p.m. Civics Studies teachers Ben Niewoehner and Matt Johnson are the RBHS coaches. Alongside the coaches are student leadership such as the co-captains, debate and event chairs and officers. Sophomore Justin Hahm is a co-chair of Policy Debate and competes in Policy and Congressional Debate. To prepare as the host team, Hahm said tasks include getting the bracket organized and making sure competitors are checking in and coming on time. During the Invite, sophomore Amira McKee helped run Registration, Public Forum and Original Oratory. She is the co-head of Original Oratory. McKee said students helped run the tournament based on their experience in an event as well as availability. Like Hahm and McKee, freshman Carson Dale is a regular attendee to debate tournaments. At the beginning of the year, however, Dale said he was hesitant on joining the team. As a student in the debate class, Dale said volunteering was a requirement, but he planned on helping regardless. Dale attributed the efficiency of the tournament to the team’s co-captains and said the stressful parts were quickly taken care of. 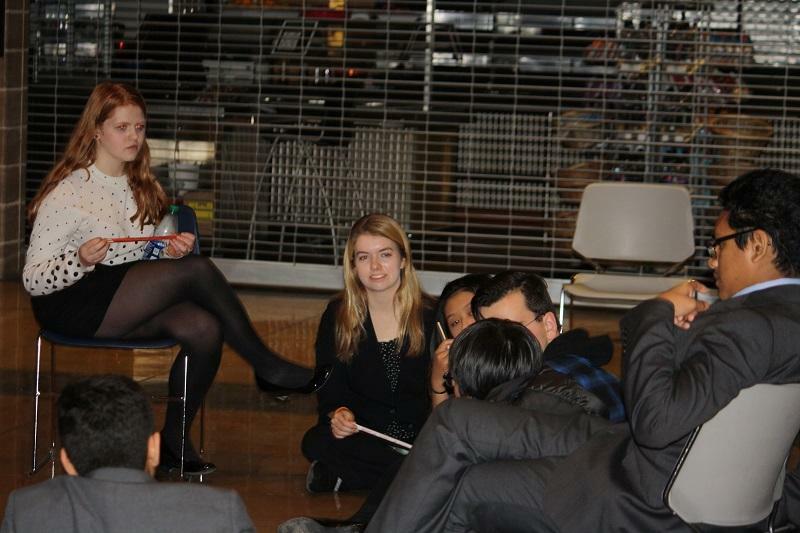 Besides Speech and Debate, McKee is also a member of RBHS’ Model United Nations (MUN). She said she wasn’t able to be very involved in the actual preparation of the tournament because she wasn’t initially planning on volunteering. The team will compete again Feb. 15 and 16 at Marquette High School. The post-season tournaments begin with the Missouri State High School Activities Association Districts at Mexico High School March 1 and 2. Are you in Speech and Debate? Let us know in the comments below. How long have you been planning for this tournament? We have been planning for this tournament for a very long time. You could even say that we’ve been preparing for this since last year. Last year, Sonya and Joshua, the old captains, placed Kiren and me in positions that gave us a lot of responsibility and skills that were very useful for this year. Without that training, we wouldn’t have known what to do. This tournament has come up in almost every leadership meeting, including those in the summer. Some of that was a reflection on past tournaments to make the 2019 tournament the best one yet. More specifically, we have been actively preparing for this tournament for about two months. We needed to do things like get t-shirts for the team, buy trophies, find judges, and gather volunteers from our team, and all of that takes a long time. So, a lot of work and thought went into preparing for our tournament. How does this tournament compare to others in the past? This tournament had some different hurdles than last year. For example, last year we had to cancel our tournament early because the roads were too dangerous. Luckily, this year we were able to pull it off. However, we had some unique problems. We have a lot of members that are also in Model UN, which also had a tournament this weekend, We were about to lose a lot of our help before Model UN got canceled. Also, the flu really caught our team off guard. We lost a lot of help because of sick members. However, I honestly think that we totally overcame any issues that were on our horizon. Nothing can stop the Rock Bridge Speech and Debate team. This tournament is sentimental to me because it’s my last one that I will help run. I will, of course, come back to judge next year, but it’s crazy to think that after four of these (and as I got more responsibilities in each one) that I will never be able to lead again. But at the end of the day, I’m very happy with what we achieved. Although it’s sad to see good bye to my last RBHS tournament, I’m happy knowing that it was one of the best ones yet.